Continuous development of mega projects such as Dahiyat Al Fursan New City (Saudi Arabia), Al Maktoum International Airport expansion (UAE) and Lusail City (Qatar) are driving the demand for diesel genset in the construction industry in Middle East region. Low crude oil prices have affected the growth of Middle East countries, which has led to initiatives taken by the governments to diversify their economies towards non-oil sectors. According to 6Wresearch, Middle East Diesel Genset market is anticipated to grow at a CAGR of 4.3% during 2017-23. 5-75 KVA rating diesel gensets acquired majority share in Middle East diesel genset market due to high demand in construction, retail and telecom sectors followed by medium rating, 75-375 KVA, diesel gensets. Qatar is experiencing highest growth rate in the region due to increasing infrastructural development related to 2022 FIFA World Cup. Iran is another potential market for diesel genset due to removal of economic sanctions. According to Ravi Bhandari, Assistant Manager, Research and Consulting, 6Wresearch,” Government & transportation followed by rental segments are the prime application areas for diesel genset in Middle East due to increasing investment in government in infrastructural projects such as Hemad International Airport, Doha Metro, Istanbul New Airport Phase-1 and Etihad Railway Network. Power rental market is also witnessing growth in Middle East due to short term power demand in various development projects. “Turkey and Lebanon are the two prime locations for export of diesel genset to other parts of the Middle East region, as these countries have strong local manufacturing base,” Ravi further added. According to Akash Jain, Research Associate, Research and Consulting, 6Wresearch, “Saudi Arabia, UAE and Turkey are expected to capture majority of the market in Middle East region during the forecast period due to recovery of the economies, highest share of construction awards as well as growing retail sector. “Development of industrial and petrochemical zones such as Sino-Oman Industrial City and Al Naayem Industrial Zone in Kuwait and Oman would also drive the diesel genset market in Middle East region,” Akash Concluded. Some of the major companies in Diesel Genset market include- Cummins, Caterpillar, Aksa, Teksan and Perkins. “Middle East Diesel Genset Market (2017–2023)” provides in-depth analysis with 232 figures and 46 tables covered in more than 400 pages. 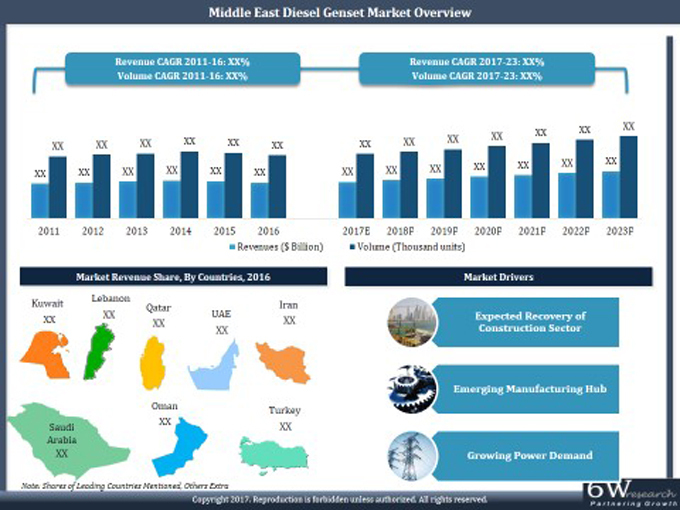 The report estimates and forecast the overall Middle East diesel genset market by revenues, volume, KVA rating and applications such as government & transportation, oil & gas and power utilities, residential, commercial and retail & logistic along with countries. The report also offer insights on competitive landscape, companies benchmarking, company profiles, market drivers and restraints.